WAIST HIGH: Beck To Cover INXS's Kick. Beck To Cover INXS's Kick. The fourth release from Beck's Record Club is to be an album-length cover of INXS's greatest hits album Kick. Kick, released in October 1987, went to #1 in Australia and is INXS's best selling album. Four singles from Kick made it into the US singles chart: "New Sensation," "Never Tear Us Apart," "Devil Inside," and "Need You Tonight." 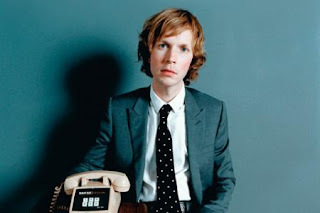 From fasterlouder.com: Beck's Record Club is an informal meeting of musical mates who get together to lark about and record an album in a day. At his official Record Club site, Beck proudly proclaims that "nothing is rehearsed or arranged ahead of time. There is no intention to 'add to' the original work or attempt to recreate the power of the original recording. Only to play music and document what happens." So far he has enlisted Feist, Devendra Banhart, MGMT, Nigel Godrich, Giovanni Ribisi, Jamie Lidell and members of Wilco to perform Record Club tributes to Skip Spence’s Oar, The Velvet Underground & Nico and Songs Of Leonard Cohen. For the INXS record Beck has recruited St. Vincent, Liars and reunited Brazilian Tropicália group Os Mutantes to help out.